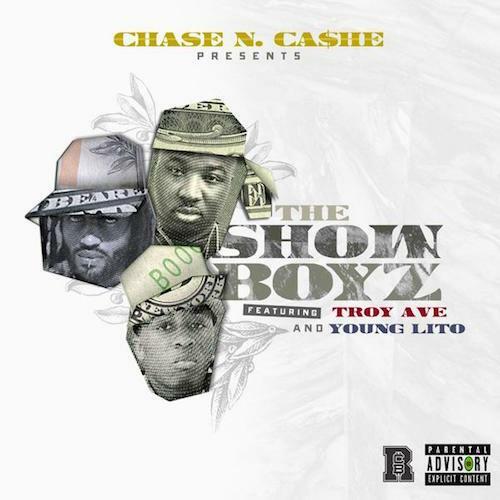 Chase N. Cashe calls upon Troy Ave & Young Lito for "The Show Boyz." Until Troy Ave bought "All About The Money" from Manolo Rose earlier this year, the Chase N. Cashe-produced "Your Style" was indisputably his biggest hit. Although Lloyd Banks doesn't show up for a repeat performance, Cashe and Troy link up again for "The Show Boyz," and BSB cohort Young Lito shows up too. Taken from Cashe's upcoming album, The Best There Is..., which is scheduled for release on December 13th, "The Show Boyz" has Troy flexing his skills as a hooksmith, delivering a swaggerific chorus over a somewhat chaotic beat from Cashe. Stay tuned for The Best There Is... next week.